2. The reason is not fully known, though “One potential explanation is that broad-spectrum antibiotics alter the gut microflora and that this in turn affects the maturing immune system in a way that prompts allergic disease development,” said researcher Dr Teresa Tsakok, who works at St Thomas’s hospital in London. (taken from Guardian). 3. Study is based on systematic review of 20 studies, not a ‘study’ in itself. 4. Nina Goad, spokeswoman for British Association of Dermatology, said this study did not imply withholding antibiotics when necessary, but instead provide insight into possible causes of eczema. 5. Caution is this review does not necessarily indicate a causal relationship, because it could be eczema children require antibiotics as they have a higher chance of skin infection. As to the gut flora being linked with eczema, there’s increasing evidence of there being a link between gut flora, skin flora and immune system though the exact mechanism of how it affects and what to do to prevent eczema is still not known. For more on diet studies, refer to Diet and Eczema Studies. Update on July 2015 study that concluded eczema could lead to an increased infection risk, with a possible reason due to lack of microbial exposure during critical periods in early postnatal life… and overprescription of antibiotics could have a direct effect on the susceptibilities of organisms to commonly used antimicrobials. I am just about to write a related post. I want to clarify one matter that almost all reporters certainly got wrong. 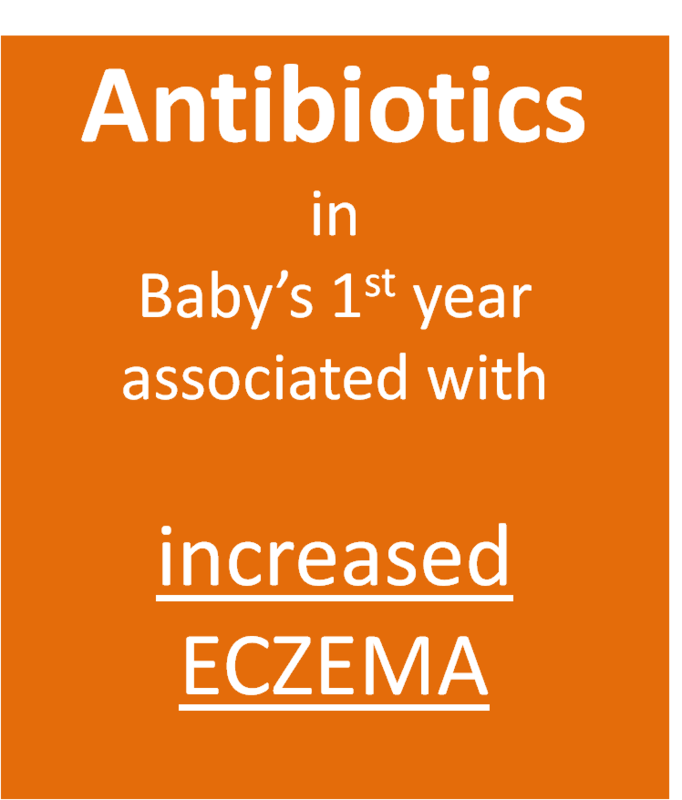 Point 1 that you make is that “Babies given antibiotics in the 1st year are more likely (40%) to develop eczema.” To be precise, the study reported that the “odds ratio” was 1.4 for two groups: kids given antibiotics and those not given antibiotics. Assuming that the risk on average for any random kid to get eczema is about 20%, what this “odds ratio” of 1.4 means is that the risk of a kid taking antibiotics getting eczema rises from 20% to 26%. Not so impressive, hey? That’s why researchers often use the odds ratio. It makes their results look more important. Wow! You’re the best when it comes to looking at eczema studies! Pls let me know when your post is up and I’ll extract your accurate wording and credit back to your post! That is unfortunately all too common with science reporting! This particular paper was published online in advance of print. Sometimes it can be hard to find those papers on the journal website.